Extraterrestrial juvenile delinquent Johnny X (Will Keenan) is sentenced, along with his band of like-minded followers, to exile on the planet earth until such a time as he performs an unselfish act. Based on the way Johnny is behaving when we first meet him, tearing up a diner while in pursuit of ex-girlfriend Bliss (De Anna Joy Brooks) and his special “resurrection suit”, it doesn't seem as if that will be happening any time soon. But after Bliss escapes with soda jerk Chip (Les Williams), oily show biz manager King Clayton (Reggie Bannister) approaches Johnny with an offer: he'll help the alien get the girl and the suit if he'll re-animate his dead star Mickey O'Flynn (Creed Barton). Sounds like it should be fun, but alas it never really pans out that way. If nothing else THE GHASTLY LOVE OF JOHNNY X looks gorgeous. It's carefully composed shots have that unique silvery glisten that one only gets from shooting on real black and white film stock, and the costumes and set design perfectly convey the aura of fifties schlock nostalgia that director Paul Bunnell is going for. Good looks aren't everything, though. Despite a good cast (that aside from those already named includes small parts for Paul Williams and the late Kevin McCarthy), and the obvious fact that Bunnell has both passion for this kind of material and enough talent to conceivably pull off his vision, the film never clicks. A lot of that probably comes down to the editing, which lets way too many scenes overstay their welcome. This feels almost like a first rough cut rather than a finished movie, and a little tightening up would definitely have helped. No matter how much tightening might have taken place, though, it wouldn't be enough to make JOHNNY X the cult classic it so obviously wants to be. It aspires to campy humor, but has precious few big laughs. And if you're going to include multiple musical numbers in your film, the songs need to be better than what's here. Plus there just aren't any of the big show-stopping scenes that every good cult movie needs. One need look no further than one of JOHNNY's most obvious influences, THE ROCKY HORROR PICTURE SHOW, for an example of how it's done. Just about every song in ROCKY HORROR has the kind of hooks that instantly get stuck in your brain. Even if ROCKY HORROR sometimes seems conflicted about exactly what sort of message it wants to send, it at least delivers the goods with multiple scenes that pushed the envelope back in the early seventies, and likely still do for many viewers today. Even if you think ROCKY HORROR is a bad film, you can't help but remember it. 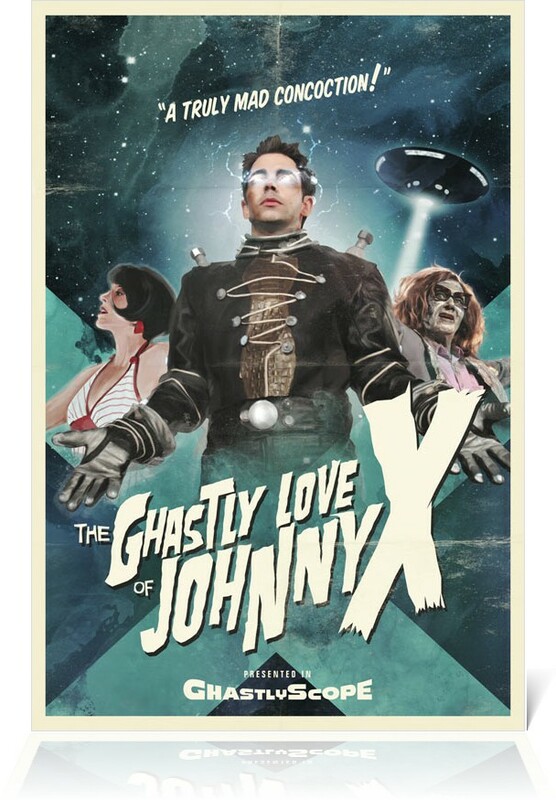 THE GHASTLY LOVE OF JOHNNY X, on the other hand, isn't likely to stick with even its admirers for long. 2 out of 4 stars.